It turns out that slowing the engines of these tiny cellular factories could extend your life-an observation relevant not only to aging research but to our understanding of how cells communicate with each another. So report researchers at the Salk Institute for Biological Studies in the Jan. 7, 2011, issue of Cell. Howard Hughes Medical Institute investigator Andrew Dillin, Ph.D., and his colleagues used the roundworm Ceanorhabditis elegans to show that perturbing mitochondrial function in subsets of worm cells sent global signals governing longevity of the entire organism. “In this study we show how signals sent from distressed mitochondria are communicated to distant tissues to promote survival and enhance longevity,” says Dillin, an associate professor in the Molecular and Cell Biology Laboratory. 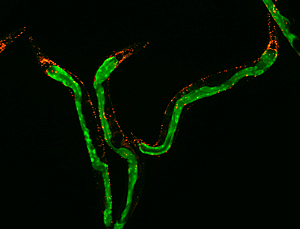 Disturbing mitochondrial function in intestine (shown in green) or nerve cells (shown in red) extends lifespan in roundworms. The identity of the signal sent from mitochondrially-distressed cells-a hypothetical factor Dillin calls a “mitokine” -remains unknown. Nonetheless, he speculates that mitokines could one day be lobbed as messengers from healthy to unhealthy tissues to treat degenerative conditions. It may seem paradoxical that reducing mitochondrial activity increases longevity because mitochondria, particles classically described as energy-producing “powerhouses”, seem like good guys. How could keeping powerhouses humming along briskly be anything but a plus? But it turns out that many investigators, Dillin included, have observed puzzling relationships between mitochondria, energy generation and longevity-interactions that suggest that living long does not necessarily require prospering at the subcellular level. The current Cell study shows it’s not that simple. Dillin and graduate students Jenni Durieux, Ph.D., first author, and Suzanne Wolff, Ph.D., engineered “transgenic” worms in which a gene named cco-1 was disabled. cco-1 encodes a protein essential for biochemical reactions known collectively as the Electron Transport Chain (ETC), which are required for mitochondria to generate energy-and thus, for cells to live. A key finding was that worms with ETC selectively impaired by cco-1 loss in either intestine or nerve cells lived longer than normal worms, while worms with ETC perturbed in muscle, skin or the germline did not, suggesting that a unique signal emanating from damaged mitochondria in nerve or gut, and communicated at a distance, extended lifespan. To determine how cells respond to the pro-longevity cue, the group monitored a cellular emergency plan called the Unfolded Protein Response (UPR). Cells mount it when proteins accumulate excessively and begin to unravel-or “misfold”-which is toxic to cells. To avert cell death, the UPR mobilizes a team of helpers who, like sales clerks at a Gap sweater table, refold accumulating misfolded proteins piling up inside a cell. When Dillin and colleagues fed worms reagents blocking the UPR, they found that disruption of cco-1 in neurons or intestine no longer had a lifespan-enhancing effect. This dramatic finding illustrates that initiating refolding of proteins, in this case in response to faraway mitochondrial stress, is in fact the very activity that enhances longevity. For example, a “metabolic” explanation for enhanced longevity, known as the “rate of living” theory, goes like this: revved up mitochondria burn cells’ energy candle at both ends, leading to (your) premature demise. Conversely, cells that parsimoniously spend energy-possibly due to compromised mitochondrial output-live longer. This study was funded by grants from the Glenn Foundation for Medical Research, the NIH and by the Howard Hughes Medical Institute.